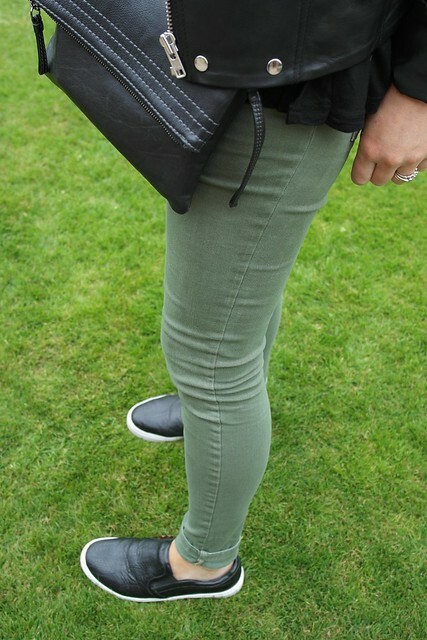 Today's outfit was based around wanting to wear my Y.A.S biker jacket again and wanting a break from blue denim. I needed to wear flats too as I had some uniform to exchange, PE kits to buy and a little bit of research/solo shopping to do. It would have been a waste to not take advantage of the huge H&M and TK Maxx beside BHS in Lisburn! 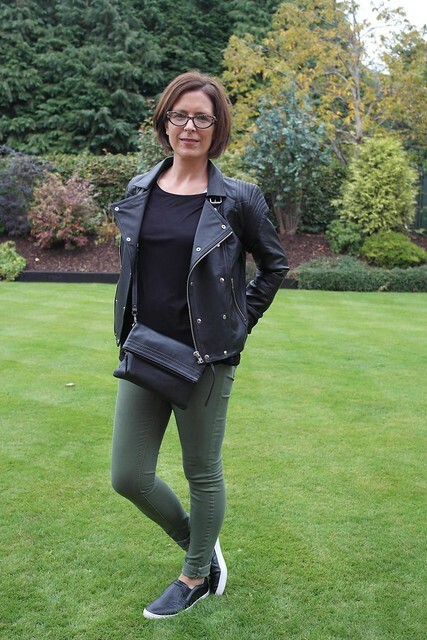 Nothing I've not featured before - Jeans are last summer's Next sale, black square cut top is from H&M, skater shoes from River Island, Cross body from Boden. 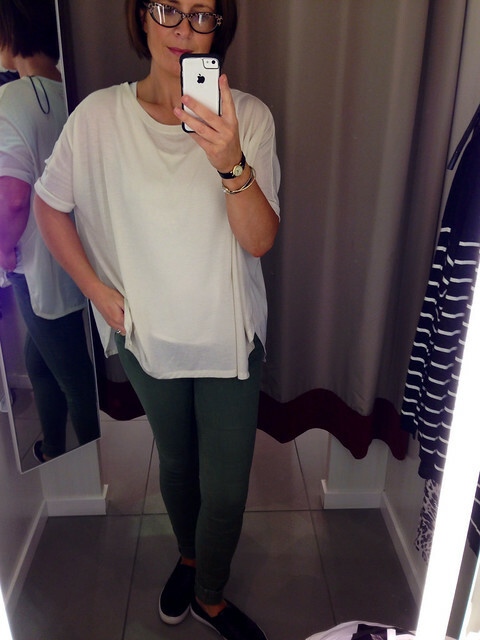 And now for some try ons in H&M. 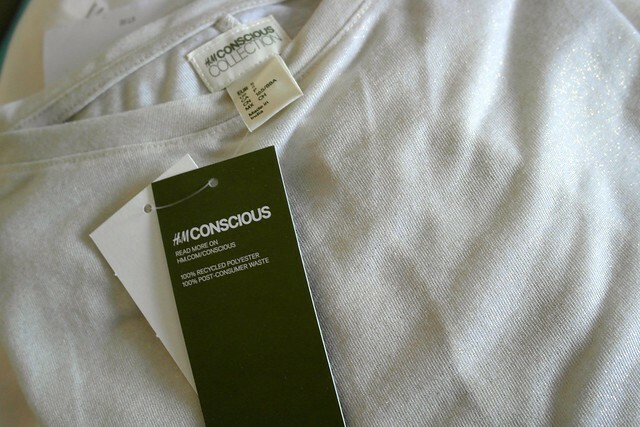 I was looking for a beige oversized top and chose this one from the Conscious Collection as it has flecks of gold through it. I can't find it online unfortunately. 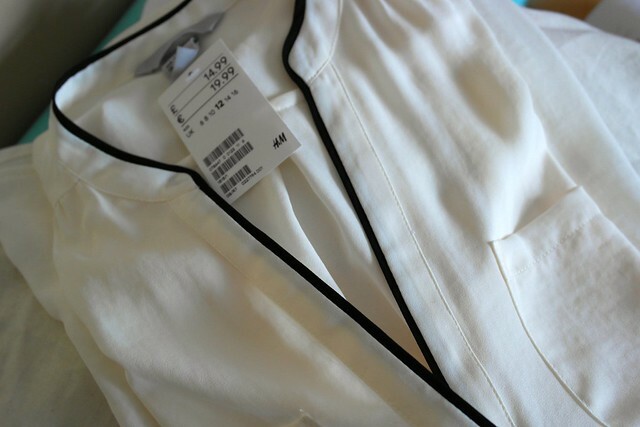 Size-wise, I bought the S.
This lighter cream top with black trim appealed more as I think it will look well with the biker jacket also. I know, I know...it's not a good idea to ever buy something that you then have to buy more items to wear with. My jacket is a bit like that at the moment I have to confess. 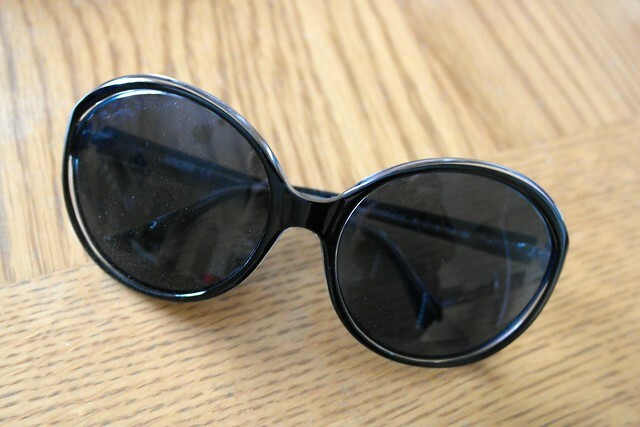 Final purchase was some new sunglasses on sale in TK Maxx. Moschino for £12. Thank you very much! If you're in the market for a real leather biker jacket, I spotted some amazing James Lakeland ones in TK Maxx Clearance - down to just £59! That's a really cool outfit and I'm really loving the shorter hairstyle. Suits you so well. 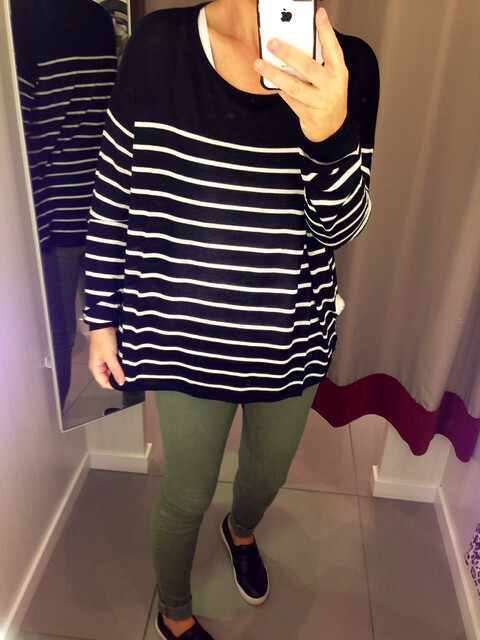 I think I may have to visit H&M .. that slouchy striped jumper is calling me!!!! Can't wait to start wearing my leather jacket again, but trying to hold off and get some wear out of my Khaki jacket! You look great in yours, love with the skate shoes! 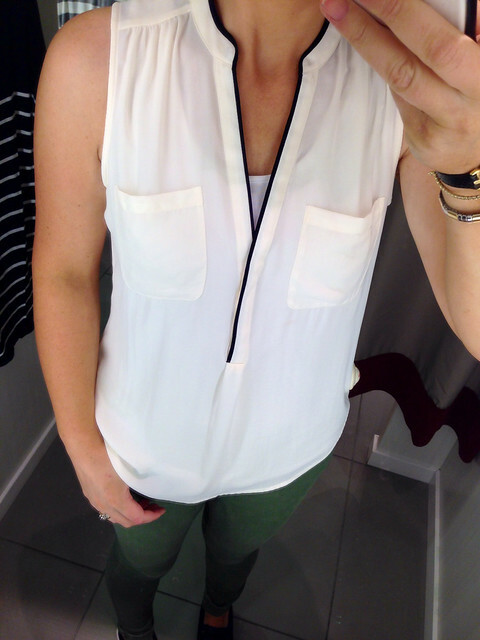 I do like the sleeveless top with the black trim, not very autumn but nice nonetheless! I have the oversized beige top with gold flecks- it has been one of my favourite purchases of the year- I bought it while in Spain - it was one of the most worn tops for me whilst on holiday this year- I loved wearing with my denim shorts and long statement jewellery- first time I've commented on your blog- I love it - been following for a while - I purchased the telephone dress on your recommendation - still a favourite of mine - and I even have friends asking to borrow it!!!! I think it's going to be perfect for autumn as I can wear all my jackets now without getting too warm and then in winter, I'll layer it under a chunky cardigan! Hi Anna - so lovely to hear from you! Thank you for taking the time to comment. I'm glad to hear that you've worn your H&M top so much. I think it's going to be a good layering piece for AW14 too. You look great Avril and that little bag is perfect with your jacket! I'm in the middle of a what to wear on my (too cold for bare) legs that matches my new ankle boots dilemma!